With the season winding down, the end-of-season reflection mill is cranking up production. A week and a half ago, the New York Times published a collaboration between their graphics editor Kevin Quealy and John Zongmin Chow that is still getting a lot of play (as of this morning, it was still on The Guardian‘s “Favorite Things This Week” h/t list). Simply put, the visualization compares the actual Premier League table to a hypothetical table in which only goals scored by Englishmen count. It’s a very slick visualization, and if you haven’t seen it yet, I strongly recommend clicking on the image below to see the interactive original version. It’s also, unfortunately, a great example of what not to do in a data visualization. The visualization itself is beautifully realized, in my view, but the assumptions underlying this work make it at best meaningless, and at worst stultifying rather than thought-provoking. Let’s start with the misunderstanding of football in the premise: that goals are all that matters in a team’s final position. This isn’t a Jonathan Wilson-esque point about the abstract beauty of the game. Sticking to concrete, table-shaping pragmatism, we can still ask why shots on target saved by non-English keepers shouldn’t be added to the tally? Why not only include goals with “English” assists? Even if you think the only thing that matters to the table are wins, losses, and goal differentials–and if you don’t think this, you have a shaky grasp of what a table is–just counting English goals tells us next to nothing about the English and non-English contributions to a team’s position. Take West Ham, a team I know fairly well and the 3rd largest mover on the table with an 8-place improvement. While it’s true that Kevin Nolan and Carlton Cole led a largely English goal-scoring tally (France/Senegal’s Mo Diame being the only significant foreign contributor), no one can seriously claim that West Ham’s anemic 40 goals, barely one a game, was what kept the team up. Instead, it was a backline led by Kiwi Winston Reid–last season’s Hammer of the Year–and Welshman James Collins. In the 11 games they played together (that’s 29% of the season, six of the Hammer’s first seven games and another five in the late-season surge to safety), West Ham amassed 6 of their 14 shut-outs (43%), 17 of their 40 points (43% again, from 5-2-4), and allowed only 7 goals (or 0.64 goals per game, a whopping 0.7 improvement over their 1.34 GpG full season average). Goals averted much more than those scored were what won games for West Ham this season, and without any disrespect to the significant contributions of defender James Tomkins or deep-lying midfielder and current Hammer of the Year, Mark Noble, it’s pretty clear that English contributions were not the most telling ones at that end of the pitch. You can be concerned about the “underdevelopment” of English players without being xenophobic. A good start would be to listen to the suggestions Michael Cox made recently on the Guardian’s Football Weekly podcast (15 May at 25:30), mostly notably making the Championship into a properly refereed league instead of a hands-free rugby scrum (Hello, MLS, I’m looking at you now too). Or you can take the French approach and set up an 80% luxury tax on player salaries. That should free up plenty of spots for native footballers. As long as I’m talking about Michael Cox, it’s worth pointing out his exemplary end-of-season statistical analysis–I hesitate to use the word “visualization” for what is, in fact, just a plain old x-y graph (click image below for link to the full post). 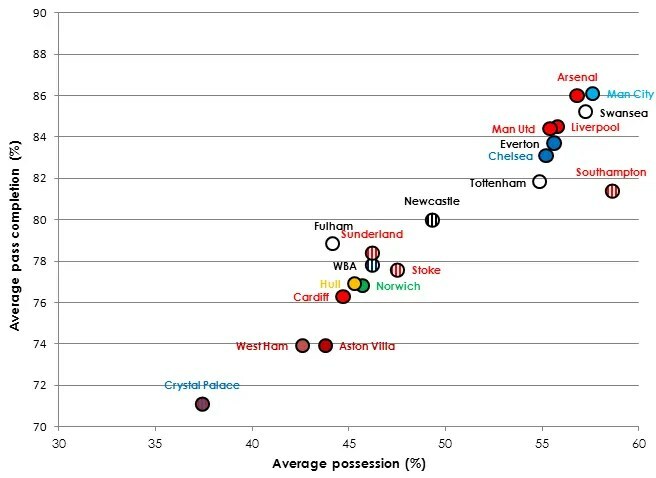 From this very simple chart plotting pass completion and possession statistics in the Premier League, Cox rightly identifies Southampton as the only team worth discussing in detail,* and uses that recognition to develop an account of the role of Bielsista high pressing that links Southampton’s Mauricio Pochettino with Barcelona’s possession football and helps to explain the blaugranas decline under Tata Martino. The takeaway point is that data visualizations and statistical analyses are rhetorical, and you ignore this at your peril. Done properly, they help us to see new insights about the game. Improperly done, they reinforce our pre-existing biases and prejudices or lead us to misunderstand the nature of the game. I’ll close with a quick shout out to Liam Ferry‘s wonderful On Goals Scored blog from which I grabbed the image at the top of this post. Ferry’s data visualizations and other graphic design work is wonderful, and well worth checking out. His post in anticipation of the World Cup from which I drew this image is a great example of visual storytelling, while his most recent post on the lack of competitiveness in the Premier League, though now dated by its counterfactual premise that Liverpool might win the title, offers a clear and meaningful visualization of the right data (in my view) for thinking about competitiveness. NOTE: It’s been awhile since I’ve posted, but I’m gearing up for some lively World Cup coverage this summer. Check out my updated Upcoming page to get a sense of my plans. And hope to see you all back next week. *Given some of my early posts on West Ham’s tactics, it’s worth noting that this chart offers strong evidence that many of the stereotypes about Allardyce’s approach were–at least for this injury-ridden season–largely justified. The only thing I would say in Allardyce’s (or my own) defense is that our position just inside Paul Lambert’s Aston Villa as a team that was able to produce a higher-than-expected possession from our unacceptably low pass completion rate does suggest that Big Sam has a few more tricks (which is not necessarily to say better ones) than Tony Pulis.